Alzheimer’s Disease (AD) is the leading cause of dementia, and the prevalence of clinically diagnosed AD nearly doubles for every 5 years for those older than 65 years [1-4]. Most of the epidemiological reports are based on the clinical diagnosis of dementia, such as using the criteria from the Diagnostic and Statistical Manual of Mental Disorders (third and fourth editions) and the National Institute of Neurological and Communicative Disorders and Stroke and the Alzheimer’s disease and Related Disorders Association [1, 5-8]. Table 1. Demographic data on cases with dementia in the elderly and healthy controls. Compared with the pathological diagnosis, the specificity of these clinical criteria ranges from 44.3% to 70.8% [8-10]. Novel fluid and imaging biomarkers to detect amyloid β (Aβ) and tau are known to increase the accuracy of the diagnosis of dementia [11-14]. We previously reported that among cases clinically diagnosed with AD, the number of Aβ-negative cases increases with age . These Aβ-negative cases are not included in AD pathologically  nor by the recent clinical definition of AD used by the National Institute on Aging and Alzheimer’s Association research framework using biomarkers [8, 17, 18]. The classical amyloid hypothesis of AD suggests that oligomer or accumulated Aβ is the first and common pathway to induce neurodegeneration [19-21]. Tau accumulation and neuronal dysfunction may follow such Aβ accumulation [22, 23]. However, this sequence was mainly confirmed in hereditary AD [24, 25] and may not be applied to sporadic AD. Indeed, we previously reported that age-related accumulation of tau may precede robust Aβ accumulation, leading to AD . Furthermore, the failure of many clinical trials targeting Aβ indicates that Aβ may not be the primary cause [27-30]. Neuropathologically, cerebrovascular diseases, primary Age-Related Tauopathy (PART), and α-synucleinopathy are the leading causes of non-amyloid dementia [6, 31-33]. Among these, age-related tau accumulation without Aβ in the medial temporal lobe, basal forebrain, and brainstem is postulated to represent PART [34-37]. The concept of PART covers cases with normal cognitive function to those with profound cognitive impairment. The latter cases are reported to include Argyrophilic Grain Disease (AGD) [38-41] and Neurofibrillary Tangle-Predominant Dementia (NFTPD) [42-45]. To explore the contribution of tau to Amyloid-Negative Dementia in the Elderly (ANDE), we studied tau accumulation with a radiopharmaceutically significant tracer, 2-[(1E, 3E)-4-[6-[11C] methylamino] pyridin-3-yl]buta-1,3-dien-1-yl]-1,3-benzothiazol-6-ol ([11C]PBB3), for Positron Emission Tomography (PET) [46-49]. Subjectively Healthy Controls (HC) without a history of brain disorders were openly recruited as candidates. Detailed medical histories were obtained through interviews conducted by a board-certified neurologist. Thorough neurological examinations, including general cognitive function tests, were performed by the same neurologist. The Mini-Mental State Examination (MMSE), revised Hasegawa Dementia Scale (HDS-R) , and Rivermead Behavioral Memory Test (RBMT)  were conducted by qualified clinical psychologists (MA, NK). Blood samples were collected to evaluate general physical conditions. Magnetic Resonance Images (MRIs) were also evaluated. Fig. (1). Region of Interest (ROI). Each ROI was manually delineated on standard MR images to which individual PET data was standardized after acquisition of individual MR images. LTC: Lateral Temporal Cortex, FRC: Frontal Cortex, PCG: Posterior Cingulate Gyrus, PC: Precuneus, PAR: Parietal Cortex, PHG: Parahippocampal Gyrus. [11C]PBB3 and [11C]Pittsburgh compound-B (2-[4-([11C] methylamino) phenyl]-1,3-benzothiazol-6-ol, [11C]PiB) were produced based on the previously reported method [46, 52, 53]. [11C]PBB3-and [11C]PiB-PET images were acquired with a Siemens Biograph16 scanner (Siemens/CTI, Knoxville, TN, USA) and with an Eminence-B PET scanner (Shimadzu Co., Kyoto, Japan), respectively. For tau imaging, [11C]PBB3 in the range of 370 MBq (Body Weight ≤50kg) to 555 MBq (Body Weight ≥70kg) was intravenously injected in a dimly lit room to avoid photoracemization. A 60-minute PET scan was performed in the list mode. The acquired data were sorted into dynamic data of 6×10 s, 3×20 s, 6×60 s, 4×180 s, 8×300 s frames. For Aβ imaging, each subject received 400 to 500 MBq of [11C]PiB intravenously over 1 minute. After the injection, static scan image acquisition was performed for 50 to 70 minutes. PET images for [11C]PBB3 and [11C]PiB were reconstructed by filtered back projection using a 4-mm Full Width at Half Maximum (FWHM) Hanning filter and a 5-mm FWHM Gaussian filter with attenuation and scatter correction, respectively. All images were processed using PMOD software version 3.7 (PMOD Technologies Ltd., Zurich, Switzerland) [54-56] and Statistical Parametric Mapping software (SPM12, Wellcome Department of Cognitive Neurology, London, UK), operating on the MATLAB software environment (version R2016b; MathWorks, Natick, MA, USA) . Acquired [11C]PBB3 and [11C]PiB images were transformed into the standard brain using PMOD, and then, SUVR images were generated with the cerebellar cortex as a reference region using the frame-summation of dynamic image for 30 to 50 minutes after [11C]PBB3 injection and for 50 to 70 minutes after [11C]PiB injection. SUVR level of each VOI was calculated in manually set ROI as shown in Fig. (1). To facilitate the visual presentation of SUVR images, [11C]PBB3 accumulation outside of the masked brain was eliminated. Mask images of the brain, set on MRI images of each case, were transformed to match the standard brain. Each T1-weight MRI was segmented and anatomically normalized to MNI152 standard space (Montreal Neurological Institute, Montreal, QC, Canada) using SPM12 and Diffeomorphic Anatomical Registration Through Exponentiated Lie Algebra (DARTEL) . The [11C]PBB3-SUVR images were co-registered to individual T1-weighted MRI using PMOD and then normalized to MNI space using the same parameters as those for MRI (flow fields method) with smoothing at 8-mm full-width-at-half-maximum. Fig. (2). Group comparison between the group with ANDE (n=7) and HC (n=12). A. Significantly high accumulation of tau is observed in large area of bilateral parietal cortices and limited area of the right frontal lobe. B. Cortical projection of SPM analysis reveals significant accumulation of tau diffusely (red: p<0.01). 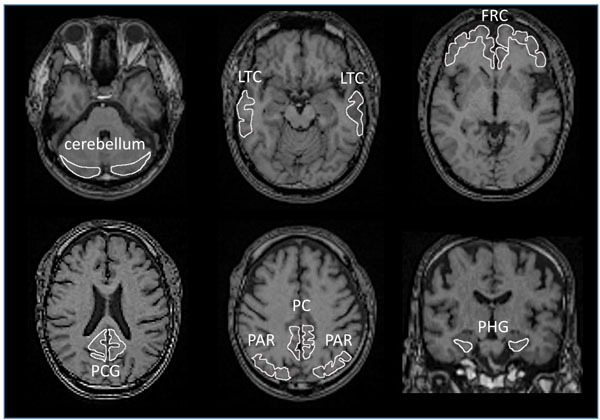 Aβ accumulation was visually evaluated based on the Japanese Alzheimer’s Disease Neuroimaging Initiative (J-ADNI) Visual Criteria for [11C]PiB-PET (J- ADNI _ PETQC _ Ver1.1) modified from ADNI PET core criteria . Four regions selected for the assessment were the precuneus-posterior cingulate gyrus, frontal lobe, lateral temporal lobe, and lateral parietal lobe. When the accumulation in one of the above 4 cerebral cortices was higher than that in the white matter just below the cortex, the case was determined as positive. When none of the 4 cortices had higher accumulation than the white matter, the case was confirmed as negative. Voxel-wise comparison of [11C]PBB3 accumulation data was performed between the ANDE and HC group by 2-sample t-test using SPM12 . In addition, [11C]PBB3 data from individual ANDE case was compared with the HC group by Jack-knife analysis using SPM12 . In both analyses, the threshold for significance was set at P<0.05 Family-Wise Error (FWE)-corrected at a cluster-level following P<0.01 uncorrected at the voxel level. In each regional SUVR, age correction was performed using by the linear regression set for the data of HC. Details are described elsewhere . In short, the age-dependent linear increase in regional SUVR was found in all ROI’s in the HC group and the linear regression curve was calculated to the data in each ROI. Age correction for SUVR in each case was made based on the linear curve. 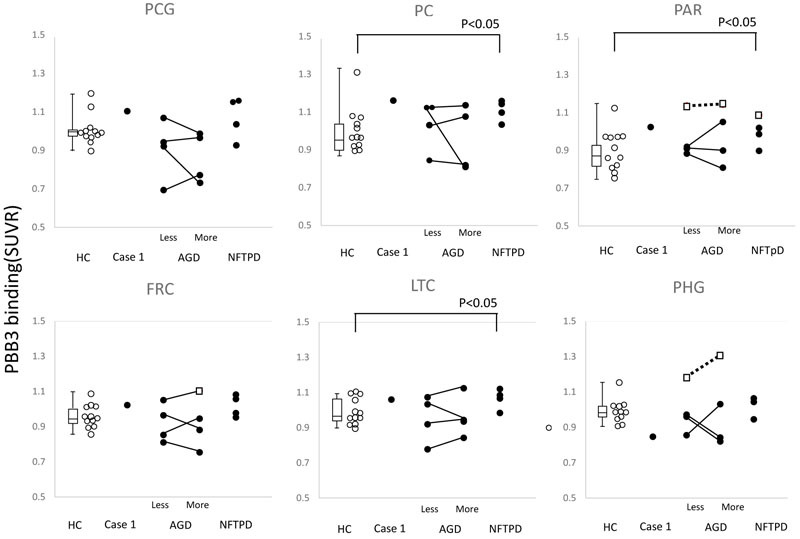 Group comparison was made between HC and AGD or between HC and NFTPD. To evaluate the effect of atrophy on apparent [11C]PBB3 accumulation in AGD, each side was separately analyzed. Accumulation of [11C]PBB3 on the side of less atrophy was compared with that of more atrophy by paired t-test. 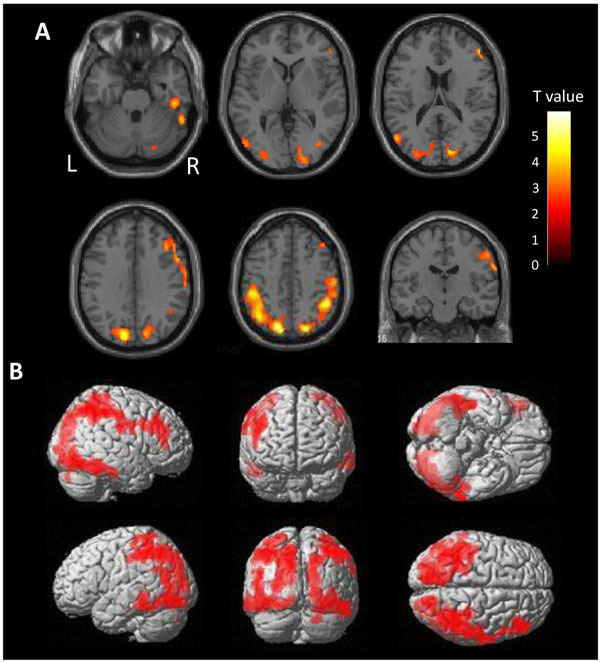 There is a very high burden of tau in the diffuse area of the bilateral parietal lobes in ANDE by voxel-wise comparison with HC (Fig. 2). Mild accumulation was found in the frontal lobes and lateral temporal lobes on both sides. Accumulation in the cortices neighboring the sagittal sinus and the transverse sinus may reflect spillover of nonspecific accumulation in the sinuses. Cortical accumulation was observed to be centered on the gyrus, not on the sulcus, excluding the possibility of vascular spillover on the cortex. Fig. (3). Regional [11C]PBB3 SUVR values in ANDE and HC. Significantly high accumulation was found in the parietal cortex, precuneus and the lateral temporal cortex of NFTPD (p<0.05). To evaluate effect of atrophy on apparent [11C]PBB3 accumulation, each side was separately analyzed in cases with AGD. Less/ More indicate side of less or more atrophy on MRI. No correlation was found. Open square indicates significantly high accumulation compared to NC. Fig. (4). Tau PET of Case1 (autopsy case). (A) High accumulation of tau was found on the right side of the parietal, frontal and lateral temporal lobes (B). Cortical atrophy was predominant on the left side (C). Fig. (5). Very limited number of senile plaques positive for Aβ11-28 were found in the temporal lobe (A) and parietal lobe (B). Neurofibrillary tangle was moderately found in the parahippocampal gyrus (Gallyas staining) (C) and was positive for AT8 staining for phosphorylated tau (D). The SUVR of AGD and NFTPD was compared with that in HC. Significantly high accumulation was found in the parietal cortex, precuneus and the lateral temporal cortex of NFTPD (P<0.05) (Fig. 3). To evaluate the effect of atrophy on apparent [11C]PBB3 accumulation, each side was analyzed separately in cases with AGD. In most cases, a great difference in [11C]PBB3 accumulation was seen between the sides, but no correlation was found between the side of atrophy and level of tau accumulation (Fig. 3). In addition, the level of individual SUVR was compared with the distribution of tau accumulation in HC. The open square in Fig. (3) indicates significantly high accumulation in the parietal lobe, frontal lobe, and parahippocampal gyrus. PET study revealed tau accumulation at the right lateral temporal lobe, frontal lobe and, parietal lobe (Fig. 4A,B). Cortical atrophy was predominant on the left side (Fig. 4C), where an apparent accumulation of tau was less severe. Pathologically, a very limited number of senile plaques immunopositive for Aβ11-28 were found in the temporal lobe (Fig. 5A), occipital lobe and parietal lobe (Fig. 5B; Braak amyloid stage A). Neurofibrillary tangles were scattered in the parahippocampal gyrus (Gallyas-Braak silver staining, Fig. 5C; Braak neurofibrillary stage II) and were immunopositive for AT8 antibody (Fig. 5D) [16, 62, 63]. Neither argyrophilic grain, Lewy body, nor TDP-43 positive structure was found. In conclusion, pathological diagnosis was mild ageing change. Four cases were diagnosed as having AGD based on clinical course and neuroimaging findings. These cases showed significantly high tau accumulation on either side of the temporal lobe (Fig. 6). The side of higher tau accumulation was on the atrophied side in 3 of 4 cases, suggesting the dominantly affected side. In contrast, 3 cases of NFTPD revealed tau accumulation on the bilateral temporal lobes and parietal lobes (Fig. 7). MRI showed mild atrophy on the bilateral parahippocampal gyrus. To explore the mechanism of dementia often found in the ANDE, we studied the possible involvement of tau with PET. Compared to the age-corrected HC, we found that tau accumulation is significantly high in the parietal lobe of cases with dementia. Together with the lesion at the precuneus and temporal lobe in some cases, we speculate that the tau accumulation detected with [11C]PBB3-PET induces dementia. We previously reported that these ANDEs result in milder dementia and progress more slowly than AD . Furthermore, amyloid targeting therapy must be ineffective in amyloid negative dementia. Therefore, distinguishing between these 2 pathophysiologies is critical. The concept of SNAP (Suspected Non-Alzheimer Pathology) covers young as well as old cases [31, 33, 65]. It also includes cases with normal cognitive function as well as those with mild to severe dementia. By definition, ANDE in the present study is included in SNAP. Fig. (6). A case with AGD. (A) Tau accumulation was found on the right temporal lobe (arrows) and parietal lobe. (B) Cortical projection reveals significant accumulation of tau diffusely on the right parietal lobe. (C) MRI reveals hippocampal atrophy on the right side. Fig. (7). A case with NFTPD. (A) Tau accumulation was found on the bilateral temporal lobes. (B) Cortical projection reveals significant accumulation of tau diffusely on the bilateral parietal lobes. (C) MRI reveals bilateral hippocampal atrophy. We previously reported that tau accumulates with age in the region related to AD . This is in good accordance with the previous reports by Jagust WJ et al. regarding [18F]-AV-1451 [65-67]. In the present study, we additionally found a further accumulation of tau in these regions, especially in the parietal lobe, in ANDE patients for the first time. Recently, age-related tau accumulation without Aβ in the medial temporal lobe, basal forebrain and, the brainstem is postulated to represent Primary Age-Related Tauopathy (PART) [34, 35, 68]. The concept of PART covers the case with normal cognitive function to that with profound cognitive impairment. [11C]PBB3 may detect this whole spectrum of PART. In contrast, we previously reported that amyloid and tau accumulation begins in Mild Cognitive Impairment (MCI due to AD) and reaches the high level in AD . Amyloid and tau may interact with each other to develop further lesions in AD [69-71]. One of the drawbacks of [11C]PBB3 is that it accumulates at cerebral sinuses including the superior sagittal sinus and transverse sinus [72-74]. The extent of accumulation varies between cases. Low accumulation can be eliminated by masking the accumulation at the sinuses, although high accumulation can affect the apparent measurement of the cerebral cortex. In the present study, high accumulation neighboring superior sagittal sinus and transverse sinus in the occipital lobe was considered an artifact. The limited dynamic range of [11C]PBB3 to detect tau accumulation also may overlook smaller lesion or milder accumulation . In the present study, tau accumulation was smaller and a milder lesion at parahippocampal gyrus and lateral temporal cortex may be underestimated in the study of [11C]PBB3. Possible overestimation of aging effect on tau accumulation at these lesions may additionally reduce the significance . Further development of more sensitive tracer is warranted . Ohara T, Hata J, Yoshida D, et al. Trends in dementia prevalence, incidence, and survival rate in a Japanese community. Neurology 2017; 88(20): 1925-32. Chan KY, Wang W, Wu JJ, et al. Epidemiology of Alzheimer’s disease and other forms of dementia in China, 1990-2010: A systematic review and analysis. Lancet 2013; 381(9882): 2016-23. Takizawa C, Thompson PL, van Walsem A, Faure C, Maier WC. Epidemiological and economic burden of Alzheimer’s disease: A systematic literature review of data across Europe and the United States of America. J Alzheimers Dis 2015; 43(4): 1271-84. Winblad B, Amouyel P, Andrieu S, et al. Defeating Alzheimer’s disease and other dementias: A priority for European science and society. Lancet Neurol 2016; 15(5): 455-532. Yamada M, Sasaki H, Mimori Y, et al. Prevalence and risks of dementia in the Japanese population: RERF’s adult health study Hiroshima subjects. J Am Geriatr Soc 1999; 47(2): 189-95. Matsui Y, Tanizaki Y, Arima H, et al. Incidence and survival of dementia in a general population of Japanese elderly: The Hisayama study. J Neurol Neurosurg Psychiatry 2009; 80(4): 366-70. Ikejima C, Yasuno F, Mizukami K, Sasaki M, Tanimukai S, Asada T. Prevalence and causes of early-onset dementia in Japan: A population-based study. Stroke 2009; 40(8): 2709-14. McKhann GM, Knopman DS, Chertkow H, et al. The diagnosis of dementia due to Alzheimer’s disease: Recommendations from the National Institute on Aging-Alzheimer’s Association workgroups on diagnostic guidelines for Alzheimer’s disease. Alzheimers Dement 2011; 7(3): 263-9. Beach TG, Monsell SE, Phillips LE, Kukull W. Accuracy of the clinical diagnosis of Alzheimer disease at National Institute on Aging Alzheimer Disease Centers, 2005-2010. J Neuropathol Exp Neurol 2012; 71(4): 266-73. Nelson PT, Head E, Schmitt FA, et al. Alzheimer’s disease is not “brain aging”: Neuropathological, genetic, and epidemiological human studies. Acta Neuropathol 2011; 121(5): 571-87. Henriques AD, Benedet AL, Camargos EF, Rosa-Neto P, Nóbrega OT. Fluid and imaging biomarkers for Alzheimer’s disease: Where we stand and where to head to. Exp Gerontol 2018; 107: 169-77. Olsson B, Lautner R, Andreasson U, et al. CSF and blood biomarkers for the diagnosis of Alzheimer’s disease: A systematic review and meta-analysis. Lancet Neurol 2016; 15(7): 673-84. Ritchie C, Smailagic N, Noel-Storr AH, Ukoumunne O, Ladds EC, Martin S. CSF tau and the CSF tau/ABeta ratio for the diagnosis of Alzheimer’s disease dementia and other dementias in people with mild cognitive impairment (MCI). Cochrane Database Syst Rev 2017; 3: CD010803. Ritchie C, Smailagic N, Noel-Storr AH, et al. Plasma and cerebrospinal fluid amyloid beta for the diagnosis of Alzheimer’s disease dementia and other dementias in people with mild cognitive impairment (MCI). Cochrane Database Syst Rev 2014; (6): CD008782. Mino T, Saito H, Takeuchi J, et al. 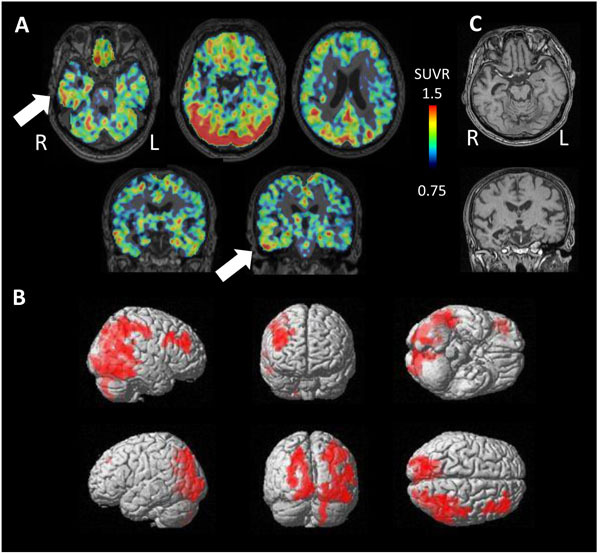 Cerebral blood flow abnormality in clinically diagnosed Alzheimer’s disease patients with or without amyloid β accumulation on positron emission tomography. Neurol Clin Neurosci 2017; 5: 55-9. Braak H, Braak E. Neuropathological stageing of Alzheimer-related changes. Acta Neuropathol 1991; 82(4): 239-59. Jack CR Jr, Bennett DA, Blennow K, et al. NIA-AA Research Framework: Toward a biological definition of Alzheimer’s disease. Alzheimers Dement 2018; 14(4): 535-62. Sperling RA, Aisen PS, Beckett LA, et al. Toward defining the preclinical stages of Alzheimer’s disease: Recommendations from the National Institute on Aging-Alzheimer’s Association workgroups on diagnostic guidelines for Alzheimer’s disease. Alzheimers Dement 2011; 7(3): 280-92. Selkoe DJ. The molecular pathology of Alzheimer’s disease. Neuron 1991; 6(4): 487-98. Musiek ES, Holtzman DM. Three dimensions of the amyloid hypothesis: time, space and ‘wingmen’. Nat Neurosci 2015; 18(6): 800-6. Selkoe DJ, Hardy J. The amyloid hypothesis of Alzheimer’s disease at 25 years. EMBO Mol Med 2016; 8(6): 595-608. Lemere CA, Lopera F, Kosik KS, et al. The E280A presenilin 1 Alzheimer mutation produces increased A β 42 deposition and severe cerebellar pathology. Nat Med 1996; 2(10): 1146-50. Lemere CA, Blusztajn JK, Yamaguchi H, Wisniewski T, Saido TC, Selkoe DJ. Sequence of deposition of heterogeneous amyloid β-peptides and APO E in Down syndrome: Implications for initial events in amyloid plaque formation. Neurobiol Dis 1996; 3(1): 16-32. Ryman DC, Acosta-Baena N, Aisen PS, et al. Symptom onset in autosomal dominant Alzheimer disease: A systematic review and meta-analysis. Neurology 2014; 83(3): 253-60. Bateman RJ, Xiong C, Benzinger TLS, et al. Clinical and biomarker changes in dominantly inherited Alzheimer’s disease. N Engl J Med 2012; 367(9): 795-804. Kikukawa T, Saito H, Hasegawa I, et al. Localized Accumulation of Tau without Amyloid-beta in Aged Brains Measured with [C]11PBB3 and [11C]PiB Positron Emission Tomography J Alzheimers Dis Parkinsonism 2017; 7: 6. Salloway S, Sperling R, Fox NC, et al. Two phase 3 trials of bapineuzumab in mild-to-moderate Alzheimer’s disease. N Engl J Med 2014; 370(4): 322-33. Doody RS, Thomas RG, Farlow M, et al. Phase 3 trials of solanezumab for mild-to-moderate Alzheimer’s disease. N Engl J Med 2014; 370(4): 311-21. Honig LS, Vellas B, Woodward M, et al. Trial of Solanezumab for Mild Dementia Due to Alzheimer’s Disease. N Engl J Med 2018; 378(4): 321-30. Egan MF, Kost J, Tariot PN, et al. Randomized trial of verubecestat for mild-to-moderate alzheimer’s disease. N Engl J Med 2018; 378(18): 1691-703. Dani M, Brooks DJ, Edison P. Suspected non-Alzheimer’s pathology - Is it non-Alzheimer’s or non-amyloid? Ageing Res Rev 2017; 36: 20-31. Chételat G, Ossenkoppele R, Villemagne VL, et al. Atrophy, hypometabolism and clinical trajectories in patients with amyloid-negative Alzheimer’s disease. Brain 2016; 139(Pt 9): 2528-39. Burnham SC, Bourgeat P, Doré V, et al. Clinical and cognitive trajectories in cognitively healthy elderly individuals with suspected non-Alzheimer’s disease pathophysiology (SNAP) or Alzheimer’s disease pathology: A longitudinal study. Lancet Neurol 2016; 15(10): 1044-53. Crary JF, Trojanowski JQ, Schneider JA, et al. Primary age-related tauopathy (PART): A common pathology associated with human aging. Acta Neuropathol 2014; 128(6): 755-66. Crary JF. Primary age-related tauopathy and the amyloid cascade hypothesis: The exception that proves the rule? J Neurol Neuromedicine 2016; 1(6): 53-7. Besser LM, Crary JF, Mock C, Kukull WA. Comparison of symptomatic and asymptomatic persons with primary age-related tauopathy. Neurology 2017; 89(16): 1707-15. Josephs KA, Murray ME, Tosakulwong N, et al. Tau aggregation influences cognition and hippocampal atrophy in the absence of beta-amyloid: A clinico-imaging-pathological study of primary age-related tauopathy (PART). Acta Neuropathol 2017; 133(5): 705-15. Jellinger KA. Dementia with grains (argyrophilic grain disease). Brain Pathol 1998; 8(2): 377-86. Yokota O, Miki T, Ikeda C, et al. Neuropathological comorbidity associated with argyrophilic grain disease. Neuropathology 2018; 38(1): 82-97. Rodriguez RD, Grinberg LT. Argyrophilic grain disease: An underestimated tauopathy. Dement Neuropsychol 2015; 9(1): 2-8. Rodriguez RD, Suemoto CK, Molina M, et al. Argyrophilic grain disease: Demographics, clinical, and neuropathological features from a large autopsy study. J Neuropathol Exp Neurol 2016; 75(7): 628-35. Jellinger KA, Bancher C. Senile dementia with tangles (tangle predominant form of senile dementia). Brain Pathol 1998; 8(2): 367-76. Kawakami I, Hasegawa M, Arai T, et al. Tau accumulation in the nucleus accumbens in tangle-predominant dementia. Acta Neuropathol Commun 2014; 2: 40. Kovacs GG, Molnár K, László L, et al. A peculiar constellation of tau pathology defines a subset of dementia in the elderly. Acta Neuropathol 2011; 122(2): 205-22. Santa-Maria I, Haggiagi A, Liu X, et al. The MAPT H1 haplotype is associated with tangle-predominant dementia. Acta Neuropathol 2012; 124(5): 693-704. Maruyama M, Shimada H, Suhara T, et al. Imaging of tau pathology in a tauopathy mouse model and in Alzheimer patients compared to normal controls. Neuron 2013; 79(6): 1094-108. Lemoine L, Gillberg PG, Svedberg M, et al. Comparative binding properties of the tau PET tracers THK5117, THK5351, PBB3, and T807 in postmortem Alzheimer brains. Alzheimers Res Ther 2017; 9(1): 96. Ono M, Sahara N, Kumata K, et al. Distinct binding of PET ligands PBB3 and AV-1451 to tau fibril strains in neurodegenerative tauopathies. Brain 2017; 140(3): 764-80. Shimada H, Kitamura S, Shinotoh H, et al. Association between Aβ and tau accumulations and their influence on clinical features in aging and Alzheimer’s disease spectrum brains: A [11C]PBB3-PET study. Alzheimers Dement (Amst) 2016; 6: 11-20. Hosokawa T, Yamada Y, Isagoda A, Nakamura R. Psychometric equivalence of the Hasegawa Dementia Scale-Revised with the Mini-Mental State Examination in stroke patients. Percept Mot Skills 1994; 79(1 Pt 2): 664-6. Steibel NM, Olchik MR, Yassuda MS, Finger G, Gomes I. Influence of age and education on the Rivermead Behavioral Memory Test (RBMT) among healthy elderly. Dement Neuropsychol 2016; 10(1): 26-30. Hashimoto H, Kawamura K, Igarashi N, et al. Radiosynthesis, photoisomerization, biodistribution, and metabolite analysis of 11C-PBB3 as a clinically useful PET probe for imaging of tau pathology. J Nucl Med 2014; 55(9): 1532-8. Kimura Y, Ichise M, Ito H, et al. PET Quantification of Tau Pathology in Human Brain with 11C-PBB3. J Nucl Med 2015; 56(9): 1359-65. Choi WH, Um YH, Jung WS, Kim SH. Automated quantification of amyloid positron emission tomography: A comparison of PMOD and MIMneuro. Ann Nucl Med 2016; 30(10): 682-9. Wang Y, Shi Z, Zhang N, et al. Spatial patterns of hypometabolism and amyloid deposition in variants of alzheimer’s disease corresponding to brain networks: A prospective cohort study. Mol Imaging Biol 2018. Gallivanone F, Della Rosa PA, Castiglioni I. Statistical voxel-based methods and [18F]FDG PET brain imaging: frontiers for the diagnosis of AD. Curr Alzheimer Res 2016; 13(6): 682-94. Ashburner J. A fast diffeomorphic image registration algorithm. Neuroimage 2007; 38(1): 95-113. Jagust WJ, Bandy D, Chen K, et al. The ADNI PET Core. Alzheimers Dement 2010; 6: 221-9. Maass A, Landau S, Baker SL, et al. Comparison of multiple tau-PET measures as biomarkers in aging and Alzheimer’s disease. Neuroimage 2017; 157: 448-63. Mega MS, Dinov ID, Mazziotta JC, et al. Automated brain tissue assessment in the elderly and demented population: Construction and validation of a sub-volume probabilistic brain atlas. Neuroimage 2005; 26(4): 1009-18. 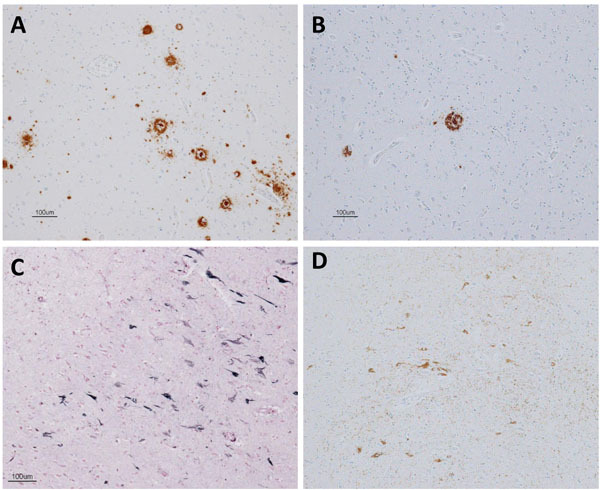 Braak H, Alafuzoff I, Arzberger T, Kretzschmar H, Del Tredici K. Staging of Alzheimer disease-associated neurofibrillary pathology using paraffin sections and immunocytochemistry. Acta Neuropathol 2006; 112(4): 389-404. Gallyas F. Silver staining of Alzheimer’s neurofibrillary changes by means of physical development. Acta Morphol Acad Sci Hung 1971; 19(1): 1-8. Takeuchi J, Shimada H, Ataka S, et al. Clinical features of Pittsburgh compound-B-negative dementia. Dement Geriatr Cogn Disord 2012; 34(2): 112-20. Schöll M, Lockhart SN, Schonhaut DR, et al. 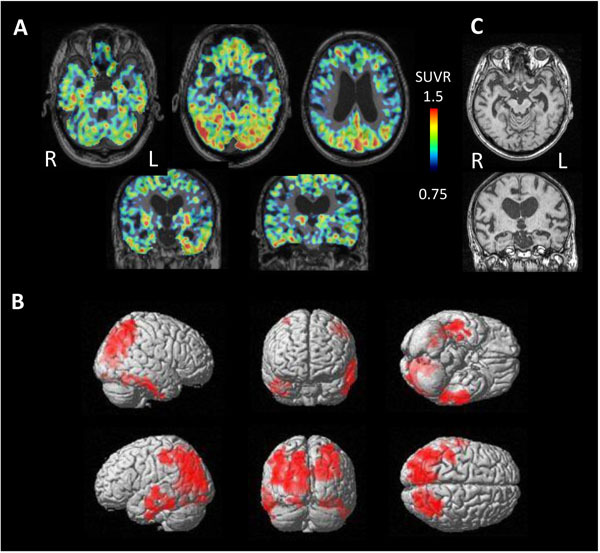 PET imaging of tau deposition in the aging human brain. Neuron 2016; 89(5): 971-82. Jack CR Jr, Knopman DS, Chételat G, et al. Suspected non-Alzheimer disease pathophysiology concept and controversy. Nat Rev Neurol 2016; 12(2): 117-24. Hall B, Mak E, Cervenka S, Aigbirhio FI, Rowe JB, O’Brien JT. 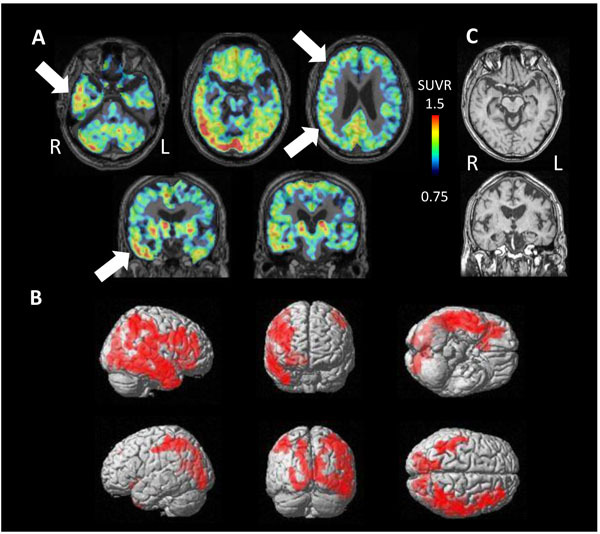 in vivo tau PET imaging in dementia: Pathophysiology, radiotracer quantification, and a systematic review of clinical findings. Ageing Res Rev 2017; 36: 50-63. Buckley RF, Hanseeuw B, Schultz AP, et al. Region-specific association of subjective cognitive decline with tauopathy independent of global β-amyloid burden. JAMA Neurol 2017; 74(12): 1455-63. Tatarnikova OG, Orlov MA, Bobkova NV. Beta-amyloid and tau-protein: Structure, interaction, and prion-like properties. Biochemistry (Mosc) 2015; 80(13): 1800-19. Pascoal TA, Mathotaarachchi S, Shin M, et al. Synergistic interaction between amyloid and tau predicts the progression to dementia. Alzheimers Dement 2017; 13(6): 644-53. Hanseeuw BJ, Betensky RA, Schultz AP, et al. Fluorodeoxyglucose metabolism associated with tau-amyloid interaction predicts memory decline. Ann Neurol 2017; 81(4): 583-96. Okamura N, Harada R, Furukawa K, et al. Advances in the development of tau PET radiotracers and their clinical applications. Ageing Res Rev 2016; 30: 107-13. Dani M, Edison P, Brooks DJ. Imaging biomarkers in tauopathies. Parkinsonism Relat Disord 2016; 22(Suppl. 1): S26-8. Zimmer ER, Leuzy A, Gauthier S, Rosa-Neto P. Developments in Tau PET Imaging. Can J Neurol Sci 2014; 41(5): 547-53. Saint-Aubert L, Lemoine L, Chiotis K, Leuzy A, Rodriguez-Vieitez E, Nordberg A. Tau PET imaging: Present and future directions. Mol Neurodegener 2017; 12(1): 19.